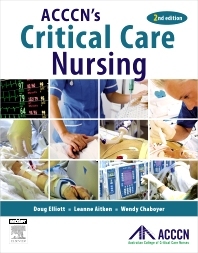 A revised new edition of this comprehensive critical care nursing text, developed with the Australian College of Critical Care Nurses (ACCCN). This second edition of ACCCN’s Critical Care Nursing has been fully revised and updated for critical care nurses and students in Australia and New Zealand. As well as featuring the most recent critical care research data, current clinical practice, policies, procedures and guidelines specific to Australia and New Zealand, this new edition offers new and expanded chapters and case studies. The ultimate guide for critical care nurses and nursing students alike, ACCCN’s Critical Care Nursing 2e has been developed in conjunction with the Australian College of Critical Care Nurses (ACCCN). As with the first edition, the text in ACCCN’s Critical Care Nursing 2e reflects the expertise of ACCCN’s highly-qualified team of local and international critical care nursing academics and clinicians. This authoritative nursing resource takes a patient-centred approach, encouraging practising critical care nurses and students to develop effective, high-quality critical care nursing practice. ACCCN’s Critical Care Nursing 2e outlines the scope of critical care nursing, before detailing the core components and specialty aspects of critical care nursing, such as intensive care, emergency nursing, cardiac nursing, neuroscience nursing and acute care. Specific clinical conditions such as emergency presentations, trauma, resuscitation, and organ donation are featured to explore some of the more complex or unique aspects of specialty critical care nursing practice.